Growing tomatoes in containers has never been more popular. Container gardening enables those with only a patio, balcony, or deck to successfully grow all types of edible vegetables. Don't have any of these? Do you have a sunny roof, porch, doorstep, or windowsill? Then you can grow fresh garden tomatoes. Another benefit to container gardening is to make gardening accessible to people with limited mobility. You can place your container garden within very short reach of your living space. The quality of the soil in your garden doesn't matter; you have complete control over the growing medium. Tomato plants can be placed for optimum sun exposure. Plants can be grown closer to your living quarters where you can more easily enjoy them. Plants may need more attention for watering, especially in smaller containers. Your choice of suitable tomato varieties may be limited by your ability to support large vines. Many people with limited or no garden space have discovered that tomatoes will grow very well in pots. Perhaps the most common mistake is using the wrong kind of pot. You'll have the most success by using your larger ones. They don't have to be 5-gallon buckets, though. I cover the information you need in the article growing tomatoes in pots. 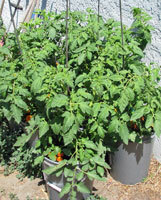 Five gallon buckets are ideal for growing tomatoes in containers. They're plenty large, cheap, and have convenient handles. You might ask around because some garden centers will give you buckets for free. Read growing tomatoes in buckets for all the details.